Allow me to pull the curtain back and show you the inner workings of this Cause & Effect with a hint of a confession. There are many things I know a thing or two about but hip hop samples would not be one of those subjects I am well versed on. I am however after years of doing Cause & Effect pretty good at doing homework for the shows I pick. Quite frankly 15 years ago I couldn't have put this show together without the help of a crate digger with a good ear. Luckily the internet is now filled with the wisdom that I lack and thanks to a bevy of blogs I was able to find multiple lists of the samples used for what I consider to be not only one the best Rap albums of all times but a highly pivotal one in the timeline for this genre, De La Soul's Three Feet High and Rising. (stylistically, samples, themes, skits, and the lawsuits that were filed against them in regards to using samples without paying to license it / getting permission) Even more amazing to me, the De La crew were Long Island teenagers when they made this pop culture capsule that is so historically important that Library of Congress selected it to be placed in the U.S. National Recording Registry in 2010. 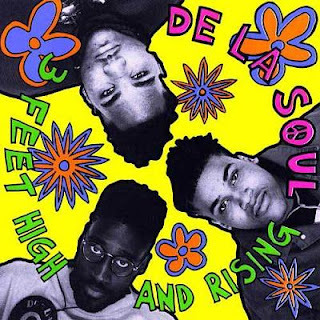 When I heard De La Soul was coming to Richmond to play the Shadrock Music Festival I thought it would be the perfect time to revisit one of my favorite albums and get to know it in a whole new way by deconstructing about half the songs they sampled to make this record possible. Listening to the music that serves as the backbone to Three Feet High and Rising still only tells half the story of what makes this record so brilliant. It is still nearly impossible to listen to these song samples and imagine how anyone had the talent and ear to know how to take bits and pieces from each tune and use them like a painter uses color on a blank canvas, further changing them with speed shifts and other effects. Add in unique lyrical content and an understated emceeing technique and you have the birth of the Alternative hip hop movement. I can't say after this show I have any better understanding of how one makes such a masterpiece but I am further convinced that all music is connected more deeply than you could ever possibly imagine. When I was a teenager enjoying this record for the first time and limited in my knowledge of music samples, little did I know that I was being introduced to an amazing body of work by artists like Johnny Cash, Cymande, Double Dee / Steinski , Sly and the Family Stone, The Headhunters, Kraftwerk, The Mad Lads, The Turtles, and oh so many more. Tune in tonight from 7PM to 9PM to hear me play two hours of the original songs (about 35 songs total) that went into the making Three Feet High and Rising. 97.3 fm for locals or stream it live here.